Lobster Gram is proud to sponsor this year’s Operation Welcome You Home (OWYH) Wounded Warrior 5K. Lobster Gram is also continuing the tradition of donating a percent of the proceeds from the Memorial Day Weekend Sales from May 27, 2016 through May 30, 2016. Lobster Gram, a 28-year old gourmet food delivery service that offers live Maine lobsters, Maine lobster tails, and fresh-caught seafood delivery services to customers across the US, is proud to sponsor this year’s Operation Welcome You Home (OWYH) Wounded Warrior 5K. Operation Welcome You Home is a Chicagoland based Not-For-Profit organization that supports veterans coming home from deployment, veterans leaving for deployment, and veterans killed in action (KIA) that have special honorary services. As a sponsor, Lobster Gram donated to Operation Welcome You Home and will be participants in the 5K race. In addition, Lobster Gram offered special military discounts and coupons for participants. This year’s promotion is 20% off of online orders, with coupon code WW5K. The coupon expires 12/31/2016 and can be used on Lobster Gram’s website at http://www.LobsterGram.com. 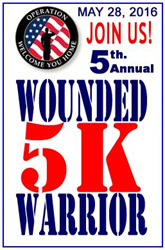 “Lobster Gram is very excited to sponsor this year’s Operation Welcome You Home Wound Warrior 5K. We look forward to continuing to help the United States military, who greatly serve and have sacrificed so much for this nation,” states Dan Zawacki, founder of Lobster Gram. "With OWYH run solely by volunteers, Lobster Gram knows that every dollar donated goes directly to supporting local soldiers." Based on positive reactions from Lobster Gram customers, Lobster Gram is continuing the tradition of donating a percent of the proceeds from the Memorial Day Weekend Sales from May 27, 2016 through May 30, 2016. Lobster Gram also recommends visiting their Chicago-based Warehouse, which offers discounted pricing and free pick-up for those in the Chicago-land area. Lobster Gram offers a large selection of live Maine lobsters, cold water and exotic lobster tails, fresh-caught seafood, steakhouse-quality chops, and delicious seafood side dishes and desserts from around the world through its gourmet food delivery services. Founded in 1987 and headquartered in Chicago, Ill., with an 18,000 sq. ft. distribution center in Biddeford, Maine, Lobster Gram focuses on providing a great gourmet experience with every product and takes pride in shipping its high-quality seafood products, “Fresh from Our Shore to Your Door®.” Visit http://www.LobsterGram.com. or call 1-800-548-3562 today for more information on the company’s gourmet seafood offerings. Operation Welcome You Home (OWYH) is a 501c(3) not for profit organization founded in 2007 with a simple request from a local Mom wanting her son, returning from deployment, to be honored. Two weeks later, another Mom had the same request. With that, we realized the need to continue honoring and showing support to the men and women serving our Country who put their lives on the line for us daily so we may enjoy our freedom. We started receiving requests from families when a loved one was leaving for deployment. We now gather to show a sea of support to the courageous men and women, letting them know they have our support when leaving to defend our Country. Sadly, with heavy hearts, we are there for KIA’s (killed in action) who have paid the ultimate sacrifice. We stand in flag line to support their families. We present families with tokens of appreciation for their sacrifice for our freedom. We stand in honor for our Veterans who have shared their lives with our Country past, present and future. When Military Heroes come home from war, they are not the same young man or woman they once were. They need our support! Thus, Operation Welcome You Home formed, a small cog in the wheel, assisting however/wherever we can. Visit http://www.welcomeyouhome.org for more information.